In fact Sprite often has a problem with working out exactly how she fits in. “Who would your friends be on Animal Farm?” I asked her. “Well, not the sheep, that’s for sure!” she said “The sheep are like the kids in my class. I guess I would be friends with Boxer and Clover, the horses. I like the chickens too – maybe I could join in protests with them. I would admire Old Major but I probably wouldn’t ever meet him and I would try to make friends with Benjamin the Donkey. Sprite has always found making and keeping friends quite a challenge! It is mainly because there are so few people in the whole population, let alone in her immediate circle of acquaintances, who are at the same IQ level as Sprite. Also her interests, which she likes to discuss at length, are not generally popular with her age peers. So Sprite’s friends are usually older students, adults, animals and the characters that inhabit her rich imaginary world and the pages of books. In fact some of her best friends are books! The Tweet family has also experienced difficulty with attempting to find same age friends for their gifted tweetlets. I had freed Sprite from her self imposed time in the depressing Naughty Corner and now we were discussing George Orwell’s Animal Farm while we drank hot chocolate and munched biscuits. “I was thinking about who I would be and what I would do if I were in the story” Sprite said. 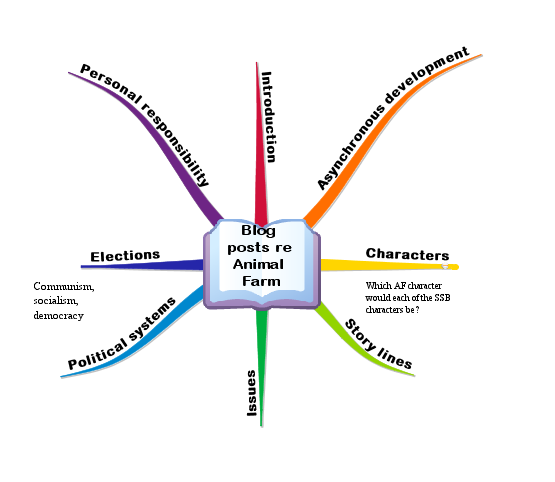 “And I worked out who most of the blog characters would be. 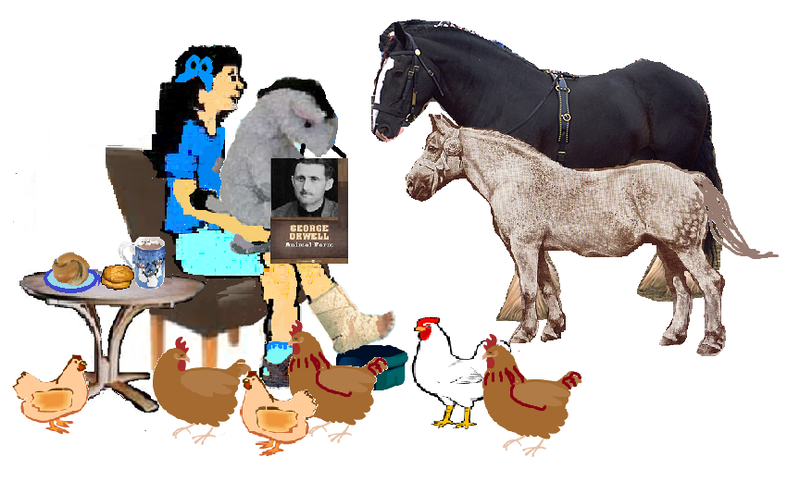 Imaginational Dabrowski would be Old Major because Old Major was the one who dreamed of the ideal place Animal Farm could be. Intellectual Dabrowski would be Snowball but I don’t know who would be Napoleon. And I don’t know who Farmer Jones is either for that matter! Isn’t it interesting that I don’t know exactly who the main ‘baddies’ are! The Black Dogs would be the bullying security force dogs. And the Pair O Noids would probably be security force dogs too because they tell you that, if you do certain things, bad things will happen to you or your family. The Twitter Birds are the chickens – they would be quick to rally and stage a protest like the chickens did. I think Boxer, the faithful workhorse, would be Tortoise – he thinks that everything will work out fine in the end if he just works hard enough. I really admire Tortoise for that! Emotional Dabrowski would be Clover the caring mare. I think Molly the vain uppity mare who moved away from the farm could be P’est Pour Parfait, the Perfectionist Poodle. I don’t think we have any ones that correspond to the sheep here on the blog. They all think for themselves. I can’t imagine any of them just bleating slogans they were told to say! I don’t know who Psycho Motor Dabrowski and Sensual Dabrowski would be. And I don’t know about the Mice or Lobsters either. Of course Caramel Cat is the Cat. Caramel usually just sleeps in a patch of sunlight. “And I suppose Eeyore/Benjamin is the Donkey?” I asked. “Yes” said Sprite “But the Memory Elephant and Columbus Cheetah are also like the Donkey because they have seen and remember how things used to be and have seen changes and even seen things going in and out of fashion and then coming back into fashion again. But Memory Elephant just remembers and comments like Donkey before Boxer’s death; whereas Columbus keeps on advocating actively and is more like Donkey after Boxer’s death. Intellectual Dabrowski had suggested that Sprite should read George Orwell’s Animal Farm. Although she is quite a bit younger than I was when we studied the book at school, it probably would have been suitable for her to read as a story or even to read as an historical allegory. We could have had some great discussions about the book from either of those angles. However her exceptionally gifted mind and the promptings of the overexcitable Dabrowski dogs lead Sprite to combine the story with the articles she was reading in the newspapers and make some completely unexpected connections and internalise the issues and messages of the book. I found that instead of talking about a simple story or an allegory we were discussing communism, socialism, democracy, personal and corporate responsibility, ethics and morals, politicians’ electoral promises, refugees, the environment and a number of other issues. In fact the discussion became so complex and had so many aspects to it that I needed to make a quick mindmap and I will write a series of posts about it. But one of the first issues that became apparent was that of Asynchronous Development. Gifted children are often capable of reading and understanding and making further inferences from material that they are not mature enough to cope with emotionally. 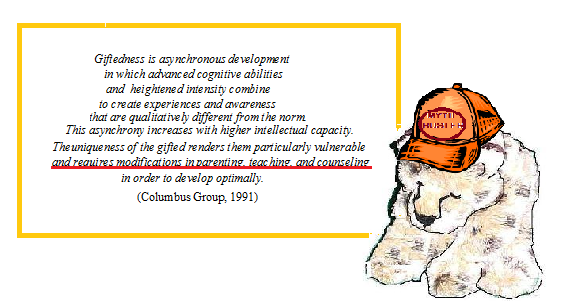 Asynchronous development is at the heart of the Columbus Group definition of giftedness and impacts every aspect of the life of a gifted child. “Just tell me before we go on any further – why are you sitting in the Naughty Corner?” I asked Sprite. “I put myself here because I am not being active in doing something when I can see things are not right or not fair” said Sprite. I called in to Sprite’s Site to check a couple of references and was greeted by Imaginational Dabrowski. “Where have you been? 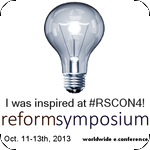 Was it an exciting expo or a creativity conference or……? Where have you been?” he asked. “Why didn’t you write posts for Sprite’s Site and why didn’t you take Sprite and Retweet along with you?” Imaginational asked. “It is probably SAD Seasonally Affected Black Dog who is making her miserable. We have had a lot of storms and rain lately” I said. I found Sprite sitting on the chair in the Naughty Corner cuddling her donkey. “He is not Eeyore. He is Benjamin and he says ‘donkeys live a long time’ and he is sad” she replied.